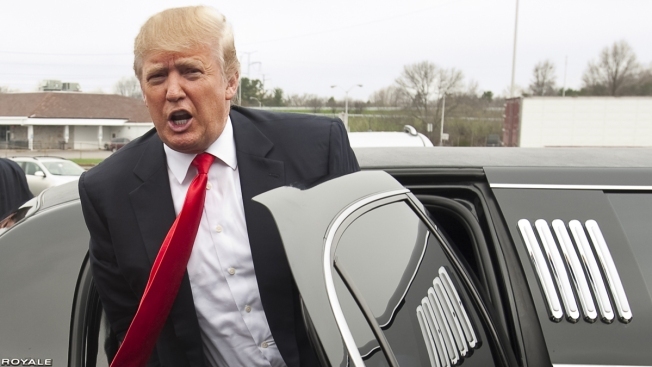 This April 27, 2011, file photo shows Donald Trump exiting his limo at the Roundabout Diner in Portsmouth, New Hampshire. A man who says he was Trump's longtime driver is suing the Trump Organization in July 2018 for unpaid overtime wages. A man who says he served as President Donald Trump’s personal driver for more than 25 years sued the Trump Organization for back pay on Monday, claiming he was forced to work thousands of hours of overtime and didn’t get paid. In the complaint, Noel Cintron claims that he worked about 550 hours of overtime annually, which he was not paid for, totaling about 3,300 hours of uncompensated overtime at time and a half over the past six years. The suit, which was filed in state court in Manhattan, says that Cintron was Trump’s personal driver for more than 20 years until the Secret Service took over the role when he became president. In the suit, Cintron alleges that Trump did not give him a “meaningful raise in over 12 years.” Additionally, though Cintron says Trump “shirked” his obligation to pay him overtime for more than 20 years, the statute of limitations only allows Cintron to make claims on overtime wages for the past six years. In the suit, Cintron alleges he worked 50 to 55 hours a week for Trump and his family from 7 a.m. to whenever his services were no longer needed that day. In 2003, his annual salary was $62,700, but he received a bump in salary to $68,000 in 2006 and, again in 2010, when his salary totaled $75,000 a year. However, the 2010 increase was granted only because Cintron “was induced to surrender his health benefits obtained through Trump, saving Trump approximately $17,866.08 per year in health insurance premiums,” the lawsuit says. Cintron, who is suing Trump Organization LLC, is asking for overtime compensation, statutory penalties, punitive damages and counsel fees.